Team dealers nationwide have many things in common, but there is an underlying commonality among us that is oftentimes forgotten: our unrelenting passion for teams and sports apparel. From new product releases to learning more about compression fitting garments, those of us who work in the industry are constantly trying to learn and keep up with an ever growing market. As we strive to better manage trainings, customer interactions and team gear proposals, our daily responsibilities can oftentimes overshadow the passion that we have for the sports apparel industry. With the daily grind weighing down more strongly than ever on employees across disciplines throughout the country, it's fair to assume that we can all use some kind of release to help us regroup and relax. Hearing or reading a good story can be just the ticket to help us remember why we work so hard, and to value those things that we find important in our lives. Last week, we read a story that made us remember why we love the work that we do; it had such an impact on us, that we wanted to share it with our customers. With over 570 shares on USA Today's website, this story is sure to jog your emotional memory, and make you remember what it feels like to be believe in super heroes. Jasper Poole-- a 5 year old Georgia boy-- was mauled and dragged down the stairs by his aunt's dog this past March. Suffering back lesions and a severed calf muscle, the boy suffered serious trauma, and remained in the hospital for several weeks. According to the WALB 10 News Team-- Jasper is recovering quickly at his family home and is taking every day in stride. While we're glad to note that the boy is happy and recovering, there's a particular detail about Jasper's story that stands out for good reason. When Jasper arrived to the hospital, he was wearing pants that were ripped to shreds, and a red Under Armour tee shirt that remained fully intact. An avid believer in super heroes, Jasper now believes that his Under Armour shirt gives him super powers, and helped save his life during the attack. 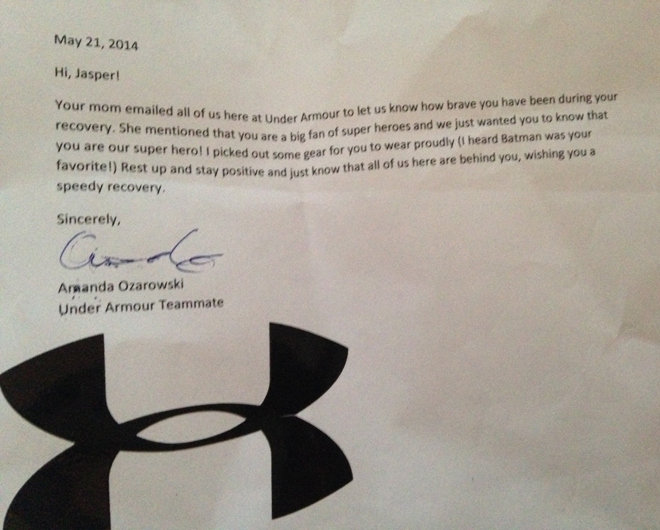 Amanda and Riley Poole-- Jasper's parents-- immediately rose to action by posting their son's tragedy on Reddit, and by writing a thought felt letter about Jasper's "super powers" to Under Armour. The company responded to Amanda's letter by sending a variety of their super hero gear to the child, along with a personalized letter stating that Jasper was their favorite new "super hero." If you'd like to see pictures of the apparel that Jasper received, check out The Huffington Post's blog for a full slide show. As an Under Armour dealer, we are touched by our partner's willingness to respond to a young fan with such a gracious gesture. If you ever believed in super powers, then this story serves as a reminder of the inherent innocence of childhood imagination, and the impact that a story can have on an individual's life. We're happy that you're okay, Jasper, and want you to know that we'll always remember you as a super hero! Under Armour's reaction to this story reminds us of some of the things that we love about our business: helping customers, hearing their success stories, and providing assistance to teams and organizations who need a helping hand. Our customer testimonials give a short glance into some of the ways that we've been able to serve our community, and help organizations give back to their charities and team members. If you're looking for someone to help you better support your team or organization, reach out to us today to learn more about our company and our core values.